"WE CARE ABOUT OUR CLIENTS" Everybody says it - We REALLY do. And we respect the fact that our service is often required at a very difficult time for many families. We did our first estate liquidation in 1977. We have been doing it longer than any other Central Florida provider. WE ARE Primarily A Central Florida Service, meaning we conduct our business within a 65-mile radius of The ViIlages, limited to Lake, Marion, Sumter , Citrus & Alachua Counties. We also own a sister-company in Clermont, which offer services in the greater ORLANDO area. We're a ONE-STOP service provider, offering not only certified and/or licensed appraisal and estate liquidation services, but also handy-man, residential cleaning services, packing & storage services, and real property sales via our network of qualified contractors and professionals. Put the burden on us. We're here to help! We DO IT ALL! We recently purchased a storage facility in Marion County, as well as a portable shipping container franchise, so we can pack it and move it for you, too. We have over 42 years of experience in various forms of secondary market sales, local and worldwide, and our in-house appraiser means that each of your items will receive a proper valuation. We did our first estate liquidation in 1977! We are appropriately licensed & insured for all of our activities, and we provide ACCORD Certificates to ALL clients as evidence of our coverage minimum of TWO-MILLION Dollars Commercial & Professional General Liability. All appropriate license copies are tendered to all contracted clients. Qualified buyers and wholesale/retail industry contacts are essential to a successful estate sale. Our company has assembled an ever-growing list of thousands of regular willing and ready buyers, which we notify of each and every pending sale date. Your event will also be highly publicized to the general public using various traditional media, Internet sites, and social media. 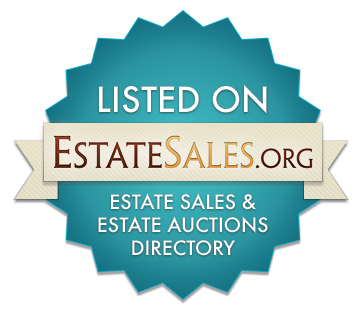 No estate sale provider advertises more than we do. That's why we sold more than TEN TIMES as much inventory as the average Central Florida estate sale provider in 2018! We handle the acceptance of all major credit cards FOR YOU, making it easier and more convenient for buyers to purchase your items. THERE ARE NO UPFRONT FEES FOR OUR LIQUIDATION SERVICES! Our fees are deducted directly from your estate sale proceeds. OUR FEES ARE AMONG THE MOST COMPETITIVE IN THE INDUSTRY! If the home to be vacated requires minor repairs, deep cleaning, paint or wallpaper touch-ups, appliances removed or installed, screens replaced, etc., we can make it happen. We are a ONE-STOP shop! Our associates, movers, packers, sellers, auction assistants, cleaning crew and repair persons are professional, well-trained and uniformed, each properly screened and sensitive to the needs of those to whom we provide our services. We offer document and photograph retention services. Rest assured that your family photos and legal documents will be carefully packed and prepared for mailing & shipping at a nominal charge to cover actual shipping expenses. Do you need to liquidate a home with an H.O.A. that does not allow on-site sales? We have MULTIPLE REMOTE VENUES, and can pack and move your items to one or more of our facilities. We are the UNDISPUTED KING of Remote Estate Sales! Special Rates for Arrangement Current & Former Military Members - THANK YOU for your Service, Courage & Sacrifice!